People’s Law School will celebrate its 25th year of providing free education by local attorneys about common legal topics at St. Mary’s University on Saturday, Feb. 16. 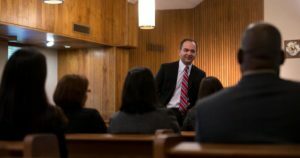 From auto accident recovery to immigration law, this joint project of the St. Mary’s University School of Law’s Pro Bono Program and the San Antonio Bar Foundation will offer a variety of legal education at the law school’s Law Classrooms Building. The doors for the event open at 8:30 a.m. Classes begin at 9 a.m. and continue until 1 p.m.
Greg Zlotnick, J.D., the School of Law’s Director of Pro Bono Programs, said he looks forward to the impact People’s Law School will have – not just on attendees, but also on the law students organizing the event.